Yes, I would like to be contacted by a Thermo Fisher Scientific sales representative. The genome has given clinical researchers a powerful tool for understanding the biological foundations of many diseases, but it only tells part of the story. 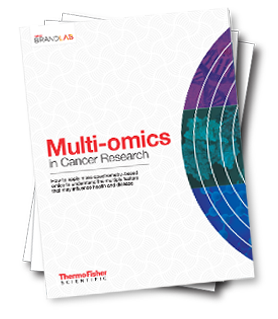 This ebook shows how different laboratories are employing mass spectrometry and other cutting-edge tools to collect richer datasets based on a combination of multiple ‘omes,’ including the proteome, metabolome and transcriptome. Through the integrated analysis of these molecular profiles, researchers can glean insights that would be impossible to obtain with any one dataset alone—for example, the mutations in the genome can be a poor predictor of actual gene expression or protein production. The case reports presented in this collection show how these multi-omic analyses can potentially lead to earlier and more accurate research predictions, and ultimately, to possible individualized treatment regimens. *For Research Use Only. Not for use in diagnotic procedures.